Check our calendar to see the next dates for this trek! Our scenic Nagarkot Yoga Hike is your best bet if you have very little time available. It allows you to explore the beautiful villages and nature around Kathmandu, and gives you a taste of Nepal’s famed mountains. Starting from Kathmandu, you will be surprised at how accessible, but immersive, this experience is — you will walk through lush forests, see beautiful temples, visit a village of the Tamang ethnic people, and see a spectacular Himalayan sunrise from Nagarkot, which is famous for its views. See more photos from our Yoga Treks. An excellent short hike at the eastern rim of Kathmandu valley, starting from and ending at Kathmandu, this yoga hike is very accessible, but surprisingly immersive. You will experience Shivapuri National Park, walk thorugh oak and pine forests adorned with rhododendrum and orchids, and see a spectacular sunrise over Mount Everest, Manaslu, Hiunchuli, Langtang, and Ganesh Himal. A perfect Himalayan escape from the bustle of Kathmandu! (Overnight in good standard hotel in Kathmandu is possible as an optional add-on – please see “Included/Excluded & Add-ons” tab). Pick-up at approximately 08.00 hrs. We drive to Sundarijal, from where we hike up a long staircase that follows the water pipeline to the entrance of Shivapuri National Park. The scenic surroundings include pine and oak forests with rhododendrons and a variety of orchids. As you continue your trek along the staircase and past the water reservoir, learn about the unique wildlife that is protected in the park, including sloth bears, leopards, wild boar and Indian porcupine. Listen for a variety of birds and keep an eye out for 150 species of butterflies. Lunch in Mulkharka. As we head toward Chisapani, you may catch your first glimpse of the high, snow-capped Himalayan giants. We set off on a 7-hour hike through lush vegetation. 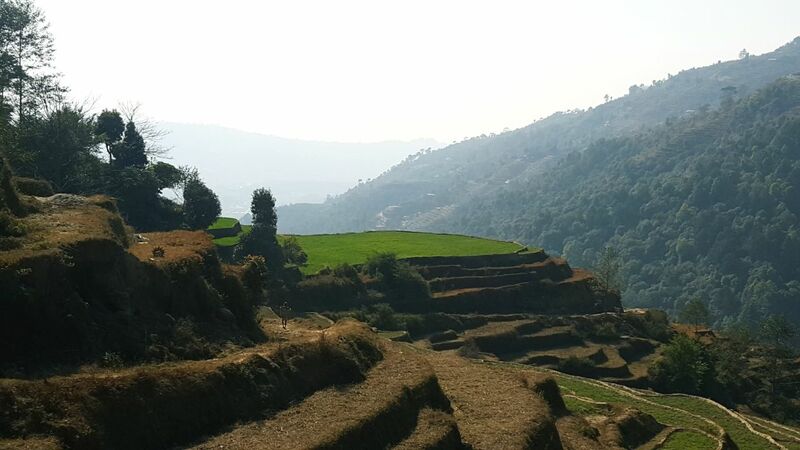 You’ll walk both uphill and downhill along dirt tracks, passing through sporadic rural settlements along the way, with magnificent panoramic views of the Himalayas. Early wake up call to enjoy the sunrise views from Nagarkot, one of the best places in Nepal to see the Himalayan mountain range. Today, our hike takes us down toward the medieval town of Bhaktapur, one of three royal villages in the valley. On the way, we stop at Nepal’s oldest temple, Changu Narayan, located on a high hilltop in the village of Changu, with magnificent Nepali architecture of metal and wood design. The route continues through terraced rice fields, small villages and pine forests, switching back and forth between the wilderness trail and a countryside road for approximately four hours. After some time at Changunarayan Temple area, we then drive to Bhaktapur and to Kathmandu. *Prices may vary according to provider and/or season. Please contact us for a quote. Any cost arising due to circumstances outside of our control such as natural disasters, strikes and political disturbances, guest sickness, etc.